Broadband @ Home » Features » 8K Video Devices hitting the Market – Is it Too Soon? Technology waits for no man – sometimes not even the consumer. 8K video devices from some very forward thinking companies are currently hitting the market, even before the mainstream has had time to fully consider 4K. A simple Google search will reveal articles dating back to 2015 detailing the rollout of 8K TVs and smartphones. However, articles on the same topic in 2017 and 2018 tend to replay the same material, as the industry seems not to have moved. 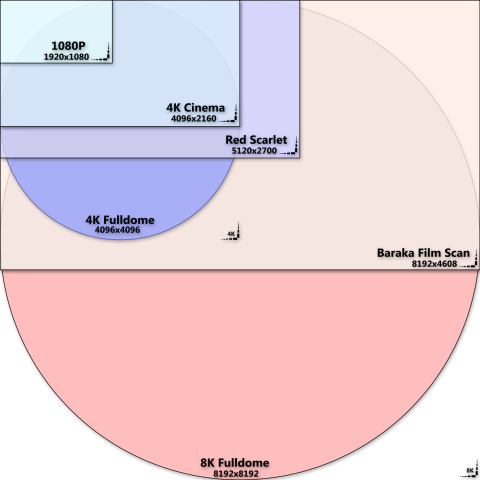 A chart comparing the scale of different HD video resolutions. Image courtesy Wikimedia Commons. Let’s take a look at the current market for 8K to see if everyone is jumping the gun, or if we are just around the corner from yet another visual revolution. Does anyone actually need an 8K Compatible TV, Console or Smartphone? Did you know that YouTube now supports 8K uploads? If you didn’t, you’re not the only one. Most content creators don’t even bother trying to record at that level. If you run across a video with an 8K option, good luck playing it (here is the first ever 8K YouTube video upload, by the way). AAA movies and most network and cable TV programs are shot on cameras that can deliver 8K; however, many of the video distributors still shy away from offering it simply because there are enough 8K televisions in the market to justify the cost. What does Streaming 8K Video Demand? Tests show that streaming 8K video requires around 50 Mbps speed on your broadband. Only the latest and greatest laptops have the ability to render the content without endless buffering. You will need a video card like the AMD RX 480 with DisplayPort 1.4 capabilities, and CPU power at the level of an i5/i7 Intel depending on your video codec. In short, either your CPU or your GPU should have some sort of video acceleration capability in order for you to even think about playing 8K. Essentially, Internet speed is the least of your concerns. Is the Market for 4K Saturated? The market for 4K streaming is far from saturated. The video gaming industry, by far the largest chunk of the modern entertainment business, still views 1080p and 60 frames per second as its standard operating rate. You can bet that if the industry with the most money has not moved even to 4K, movies and music will probably lag behind. Many of the largest electronics companies, including giants Samsung and Sony, have yet to fully commit to pushing 4K into the mainstream market. With this in mind, it will likely be a few years before we see any kind of push for 8K. Should you invest in 8K Devices Now or Later? If you absolutely have to be the standard-bearer in your neighborhood, you can find 8K devices for your home or office. However, there are very few applications or content that you will be able to actually play on these devices. This includes applications and content in highly specialized niche industries that would actually benefit from the use of 8K visuals and streaming capabilities, such as landscaping and geo-positioning. You can bet that the market will eventually catch up and begin to use 8K streaming and 8K devices commercially. Technology tends to find a use for its leading-edge products at some point in time or another. However, no one knows when this wonderful day will be. While waiting, you will probably be paying quite cost premium for the privilege of being on the cutting edge, even if it is so far out as to be invisible from the rest of the field.